Lash gra-Dushnikh is an Orc miner living in Karthwasten. She is originally from Dushnikh Yal. Apparently she left there on bad terms with her mother Gharol, as per her response to the completion of Gharol's Message. 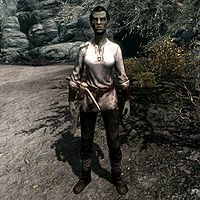 If you side with Ainethach when completing the Sanuarach Mine quest, you will increase her disposition and thus become Blood-Kin at Orc strongholds if you aren't already. During your first time in Karthwasten, Lash will be with the other miners as a group of Silver-Blood mercenaries take over the mine, after which she will resume her normal schedule: she sleeps in Karthwasten Miner's Barracks between midnight and 8am, then heads outside to work for twelve hours, ending her workday by relaxing in the barracks until her bedtime. Lash wears a set of miner's clothes and a pair of boots, and is equipped with a pickaxe. She carries a key to the miner's barracks and a selection of lower-class items and gold. She can be heard saying, "I work in the mines. I hunt. Everything else I do is my business." or "These Reach folk are so... nosy." If you have yet to help Ainethach reclaim his mine, she will remark on the problem: "You should talk to Ainethach. He runs the mines. Used to anyway." or "Ainethach needs to get rid of those Silver-Blood. Then maybe we can go back to work." If he is dead, she will instead say, "Ainethach's dead, but that doesn't mean we can stop working." If Ragnar is alive, she may comment on him: "Ragnar has a strong arm. Pity he isn't an Orc." During The Heart of Dibella, asking Lash about a young girl in Karthwasten will have her reply, "I thought Enmon and Mean had a little girl, but I haven't seen her in a while." If you ask her mother, Gharol, if she trades with other cities, she will explain, "Occasionally. But an Orc blade is a very personal thing. Anger, regret, pride. All these things are put into our steel. When my daughter Lash chose to leave the stronghold, I forged a sword to channel all my shame and grief. Honor me with a task, outlander. Bring the sword to my daughter, if you see her. It'll be all she needs to know." Upon bringing the sword to Lash, she will respond, "So that's it, then. 'Don't come back.' Thank you. Here. You honored my mother's task and should be rewarded. Now, I need to be alone." She will leave you and leave conversation. Belchimac: "I don't like bunking with Orcs. It's not... clean." Lash: "If you want me to leave, you could challenge me to a fight. I promise to stop once you've lost an arm." Belchimac: "What I meant to say was... I love having an Orc here in the barracks. They're so... pleasant." Lash: "Why do your people claim the Reach is theirs? The Orcs have been in these lands just as long." Belchimac: "You wouldn't understand, Lash. Your people aren't smart enough for politics." Lash: "Is that so? I'll remember that next time we're in the mine tunnels... alone." Belchimac: "Did... did I say you weren't smart? I meant to say that I'm not smart, Lash. I'm just not smart enough to answer your questions." This page was last modified on 30 July 2015, at 04:25.